When you don't have time for a full backpacking trip, there is still time for a wonderful wilderness experience. Just throw a few things into your day pack (warm clothes, food, water, a map, and a first aid kit) and hit one of these trails. You won't be sorry! And you can cover a lot of ground this way if you start early and keep hiking. The photo at below right is of P when he was just turning nine years old...and completing a twenty mile hike in the Grand Tetons. Not that YOU have to hike for twenty miles to see anything good. Some of these trails are only a few miles long. But without a heavy backpack, it's pretty easy to cover more ground. We've listed them here from north to south...but each of our destination pages has a list of many more day hikes by highway and park. 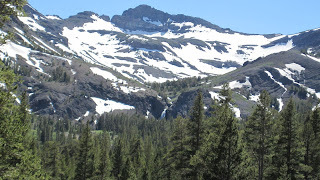 Donner Pass/Highway 80: Castle Peak: Our favorite day hike in this area takes you to a grand view overlooking Donner Pass and the whole northern Tahoe region. The trail is pretty straightforward--you head northwest from the trailhead to the top of the ridge, then turn northeast to climb up the ridge up to the peak. The last little bit requires some scrambling, but only if you insist upon standing on the very top. We did, and it seemed worth it. In the winter, you can snowshoe up to Andesite Peak nearby, and get many of the same views, including a nice on of Castle Peak. Tahoe Basin: Rubicon Trail: The premier trail in the Tahoe Basin, this one leads along the edge of the lake from DL Bliss State Park to Emerald Bay. Parking can be a problem because the trailhead is also a great beach access point, so get there early. Then enjoy about 8 miles of beautiful views, an occasional small climb, and lots of other hikers. Keep your eyes open for osprey and eagle nests...and there are nice spots for a picnic once you get near the point towards Emerald Bay. Carson Pass, Ebbetts Pass: The good news in this area is that most of the backpacking destinations are under five miles away--and that makes them ideal for day hiking as well. True, you won't get to watch the sun go down from the shore of the lake...but you can still have a great adventure. Either of these passes has the Pacific Crest Trail going both north and south, and you can't go wrong with that. But if you want to explore other areas, our favorite might be Grouse Lake out of the Blue Lake Trailhead on the eastern side of Carons Pass. And yes, it's about 11 or 12 miles...but the section of this trail that marches along the southern face of Deadwood Peak is just plain amazing, with views that go on forever. 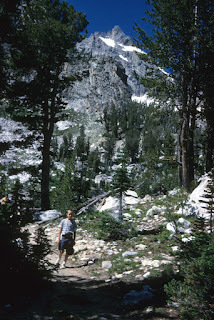 Sonora Pass: Sardine Falls: Just about 2.5 miles east of Sonora Pass, this is a fun hike. There is no real trail, nor is there a marked trailhead. But if you are paying attention, it will all work out. As you come down the pass, keep your eyes open to the canyon on your right. Soon you will see the falls...and if you stop your car and open the windows, you will hear them roar! Drive down to the meadow, park, and follow the use trails and double track (you'll likely have to wade across the creek a couple of times) and you can walk up to the falls. Lovely and fun. Photo at right is from July of 2010 (a very snowy year) taken from the highway just above the meadow. 4 miles round trip. For a more adventurous hike in this area, take the use trail up to Blue Canyon Lake. This rough trail leaves Highway 108 just beyond the small waterfall on the right hand side as you climb up through two steep switchbacks just below 9,000 feet. And then it follows the little creek up to the lake. Don't be misled---this is longer and steeper than you expect. It also really beautiful, offering views over much the Sonora Pass area, cascades, flowers, and, of course, Blue Canyon Lake! Gaylor and Granite Lakes: This may be our favorite shorter day hike in Yosemite. The trailhead is at Tioga Pass, just a few yards from the park entrance station. It goes straight up the ridge for about a mile, and the views on of the ridge will show you Mt. Dana, Gibbs, and the whole Cathedral Range. And then it goes straight down into Middle Gaylor Lake. From there the views will still captivate you--but don't stop there. You can follow a use trail up to Upper Gaylor Lake, or simply walk cross country to the Granite Lakes. Go ahead and explore. It all feels very much as if you have been given a spectacular alpine playground, just for your own private use. Perfect. And there are fish in all of these lakes! Pothole Dome: This one is almost too east. Right at the western edge of Tuolumne Meadows is a parking lot, Follow the trail around (NOT THROUGH) the meadow to access Pothole Dome. Hike uphill. You will be rewarded with stunning views of Tuolumne Meadows, the surrounding peaks, and even a glimpse into the Grand Canyon of the Tuolumne. Less than a mile. That's real value! Cloud’s Rest: This is our favorite longer dayhike in Yosemite. In our opinion it offers better scenery, higher elevation, and fewer people than Half Dome. You start at the Olmstead Point/Tenaya Lake trailhead, and climb up to the ridge on the way to the Sunrise High Sierra Camp. But at the top of the ridge you turn right, follow the east side of the ridge south, and then climb up the final ascent to Cloud's Rest. The last 300 yards is impressive, as you can see that the granite is a sheer wall that falls off nearly vertically into Tenaya Canyon. It does focus your mind rather splendidly on what your legs are doing! From the top, the scene is among the best in the park. 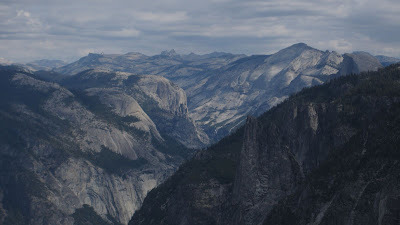 You get a complete view of the Cathedral Range, the Clark Range, the eastern ridge of the park...and you are looking down at the people on the top of Half Dome, and beyond them into Yosemite Valley. Unbelievable. Better than Half Dome. Really. 14 miles of joy. Yes, there is a line to go up the cables. And now you need a permit as well. And it takes a long time, and there are stupid people on the trail who really shouldn't be there, and who make it harder for everyone else. The permit system (has improved things, but this is still very much a lesson in patience and getting along with people. Let's add Taft Point to this hike, and it will include a visit to the Fissures and the dramatic views from the edge of the canyon. (We love the signs at the trailhead that encourage you to "control your children" on this hike. Good advice for any hike!) All of this can be done from the same parking lot and trailhead, and if you do both Sentinel Dome and Taft Point, you might get a total of three miles of hiking. That's a pretty good value of views per mile! If you want even more adventure, follow this same trail down to Dewey Point on the Pohono Trail. This is another 4.4 miles from Taft Point, and except for a pleasant bridge crossing of Bridalveil Creek, it doesn't have great views. Until, that is, you get to Dewey Point. And then you have some of the very best views of the whole park. Really wonderful stuff, and you will not find very many people here--after all, it's five miles from the nearest trailhead, and that discourages a lot of people. Don't let it discourage you. Take your time, enjoy your lunch, and enjoy the show! Sequoia/Kings Canyon: Mitchell Peak: This is perhaps our all time favorite day hike of all time. Like the hike to Jennie Lake, it starts at a trailhead well off the beaten track, on the way from Grant's Grove to Sequoia, and the rough and tumble dirt road is almost more than you can bear for a passenger car. Our little 2wd Escape did fine, and we've done this drive in an old Volvo wagon, albeit slowly, and with an occasional prayer. But once you get out on the trail, this one is just spectacular. It heads up a slope, then across to show views down into a lovely creek. More climbing takes you through a meadow or two (look out for mosquitoes early in the year--they were worse here than anything P has ever seen one July) and then up to a saddle. From the saddle you can go east into the Sugarloaf region, south towards Jennie Lake, or north and climb Mitchell Peak. The climb to the peak is steadily uphill, and you eventually work your way all the way to the northwest side of the mountain before clambering over some granite boulders to the summit. OK, so that doesn't sound like the perfect hike. That's because we haven't mentioned the view from the top: a 360 degree panorama of stunning mountains, including the Sierra Crest most of the Great Western Divide. You just can't stop looking at it. And NO camera will do it justice. Our daughter did this hike with us one year and then spent a few minutes on top trying to capture it all with a video. That's one of her snapshots above...This hike is on everyone's Top Ten Hikes...unless they haven't done it. Death Valley: Golden Canyon—maybe the best day hike in the Valley itself, this is a great adventure, climbing up from about sea level through Golden Canyon to Zabriskie Point, and then back down again, this time through Gower Gulch. It's a bit of a disappointment to get to the cars and parking lot at Zabriskie Point, but after a quick snack, we just headed back down the trail and left the rest of the tourists behind. We saw only two groups of people on the Gower Gulch section of the trail. Narrow canyons, beautiful eroded rock, wonderful vistas, and more geology than you can learn in a year, all in about six and a half miles. But do this one in the spring, when temperatures are pleasant. In the summer, the climb up Manly Beacon and beyond would drain you of every drop of sweat. 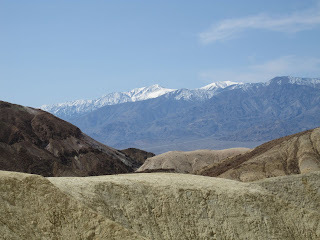 The photo at left is from the upper reaches of Golden Canyon, looking out over Death Valley and towards the snowy peaks of the Panamint Range.